We've seen Android-powered phones, tablets, netbooks, TVs, and even robots--but did you know that Android can be used to grow gardens? I mean, it makes sense since the little green guy literally does have a green thumb. All jokes aside, a Japanese company called Brilliant Service was showing off a very cool concept at Google I/O called Farmbox. "In the future, we predict plant factories will make their way to regular households as home electric appliances,” Brilliant Service announces on its Website. “Farmbox is that very factory." The hardware--known as Plant Factories--are computer-controlled boxes that provide lighting, water temperature, air temperature, nutrients and oxygen gas to your plants. 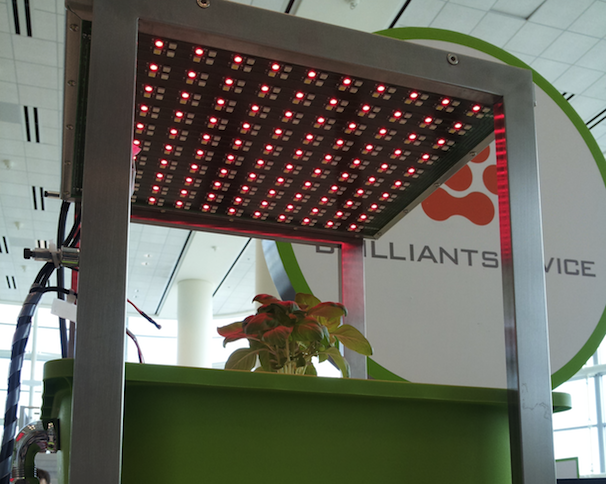 Each plant box has a blue LED light as well as red LED light, which, according to Farmbox, can be used to control the taste or the growth rate of your plant! When your phone is hooked up to the Farmbox, the Farmbox app (which isn't currently available in the Android App Market) will automatically document your basil's growth data. For example, you can record the number of times you water it, the temperature you keep it at and whether you give it any food. That data is uploaded automatically to a cloud-based service that will store that information for your amazing homegrown basil. If one of your friends comes over, tries your amazing basil, and wants to grow it in their own home, they can obtain your information from the app. Or, say you've always wanted to grow orchids, but have no idea how to, you can find another person's successful orchid growing plan. Urban farming is all the rage in the move toward more sustainable food so I can see something like Farmbox having a lot of potential. They definitely need a better Website, however, and probably some English-speaking PR people to help them spread the word. The good news is that Farmbox was completely sold out of SDK kits by the time I visited them on the second day at Google I/O so apparently, a lot of people thought the idea was cool!